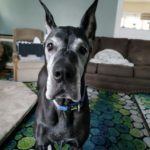 Danika is 9 years young and is looking for a home that will be active enough to stimulate her mind, but calm enough to enjoy cuddle time on the couch. Danika is fine with older children but doesn’t like newborns. Danika needs slowly introduced canine siblings. She would be best as a only dog or with a submissive male. Dani Girl packs a whole lotta personality into a pint sized package! Will Danika win the race for your heart?